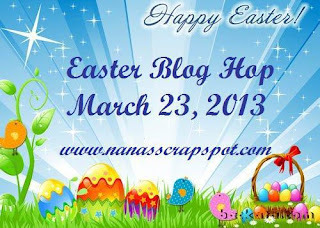 Welcome to the "Easter" Blog Hop! We're so happy you could join us today! You should have arrived from Mary. If you happened by my blog or are joining me from your dashboard, head over to Miranda's blog to start at the beginning. We don't want you to miss any of the fun! In addition to seeing a lot of awesome Easter creations, there is some blog candy available too. Miranda will be giving away a Michael’s gift card. To be eligible for the blog candy, you are required to visit each stop in the hop and leave a comment! The winner will be announced Wednesday, March 27th on Miranda's blog! This is from Hippity Hoppity SVG Kit. I did ink up the edges in Tim Holtz Tea Dye Distress ink. Embossed the hat with Cuttlebug swiss dots folder. The flowers and bling are from Recollections. The paper is left over scraps. I just love this big egg shaped card. Here's a close up to show the embossing and those google eyes! Want to win my blog candy???!!! I'll announce a winner on my FB page March 28th so make sure you're a Fan. Next on the hop is Christine !!! Happy Easter!!!! We hope you enjoyed the hop today! Oh my gosh my jaw dropped to the floor, you really rocked this one! wow!! it is very beautiful!! I also love the egg shaped card.. and the hat is just awesome!! Love your Easter Card! That Duck is so Cute! Love the hat with flowers. Thanks for Sharing! I'm already a follower of your Blog and facebook. Thanks for the chance to win. Love the egg-shaped card. That chick is adorable. So that's the way to get the egg card to stand up - turn it sideways! Great idea. Love the card. Thanks for the chance to win blog candy. Oh, sorry, I didn't see I had to leave my email. Well, if I'm a lucky winner, I'll give it to you via Facebook message. Too cute Tara. Love the chick with her cute eyes. Sweet card creation. I do not know how to use SVG files. I have a Cricut but do not have the software that once was sold for using SVG files. I'm a follower & liked you on FB. Thanks for hop. I love your card!!! Cute lil chick! OMGoodness, this card is ADORABLE! I love shaped cards! Thanks so much for being a part of the hop! New fan - you made such a sweet chick with googly eyes and this was from scraps - wow! She's adorable Tara, really beautiful!! Oh my goodness, I just love this little chickie! TOO CUTE! New Blog follower and FB as well! I just LOVE your card! Especially her googly eyes =) Linked up to your party too! Hi Tara - I follow our blog - I liked Facebook - and here is my comment - you project is adorable - I love those colors especially the purple choices - thanks for the hop! Oh how stinken cute! I love the fun little chickie and the shape looks awesome! Love it! You know that this is Totally cute,right! !I LOVE your adorable chick! !The embossed hat is so COOL and the eyes are darling! !Awesome card! You hit the "WAY PAST CUTE" button and win the Easter basket award! LOVE every little detail about this card. Thanks for sharing your talents with us. What an adorable Easter card! The chick is so cute! Super cute card ... sew glad you stopped by my blog with the TBD Bunny Hop and invited me to visit you!!!! I'm a new follower!!! Hey Tara I have been watching your video tutorials, they are so interesting and informative! Just noticed u r also a twin mommy, me too! I have boy/girl 3 year old twins who keep me hopping! Just wanted to say hi and let u know how much I am enjoying your stuff! Aaaaah, such a cut chick and love the sweet hat with the pretty flowers. Hi Tara! Beautiful job with the card! LOVE the chick! Following you in every which way :) Thanks for the chance to win! That is sweet!I love the ribbon and the little flowers on her bonnet! A Facebook follower and of course another here on your blog!